Faf du Plessis scored his ninth Test century (his first at Newlands) as the Proteas built a substantial first-innings lead over Pakistan on day two of the second Test in Cape Town, writes SIMON LEWIS. A feature of Du Plessis’ innings was his powerful driving, and he brought his ton up with yet another well-timed drive through the covers, this time to the Oaks enclosure as he and Quinton de Kock ran three to bring up the Proteas skipper’s century off 209 balls. Du Plessis’ innings came off the back of a pair in the Centurion Test, as well as being ranked as one of the lower-scoring captains of 2018, but he approached his innings with great care and sensibility, determined not to give his wicket away. Du Plessis and Bavuma shared a crucial stand of 156 for the fifth wicket before Bavuma nicked a ball from Shaheen Afridi that straightened, Sarfraz Ahmed taking a good catch. Bavuma’s 75 came off 162 balls with 10 fours and was deserving of a century – and was a fitting answer to his doubters. De Kock dominated the scoring in the late afternoon session, scoring 35 runs to Du Plessis’ 15 runs as they brought up their 50-run partnership off 77 balls. Du Plessis’ innings came to an end after he was turned inside out by Shaheen Afridi, getting the faintest edge as the ball passed through to Sarfraz Ahmed, who needed the help of ‘snicko’ to convince the umpire of the validity of the dismissal. An exhausted Du Plessis returned to a huge ovation after a wonderful Test inning of 103 runs scored off 220 balls (13×4) that played as pivotal a role in the Proteas dominating the first two days of the Test. De Kock went to his 50 off 59 balls shortly before the close, ending the day on 55 not out alongside Vernon Philander on six. On a bruising day for the Pakistan fielders, only Shaheen Afridi emerged with much to show for himself, picking up 3-112 off his 26 overs. 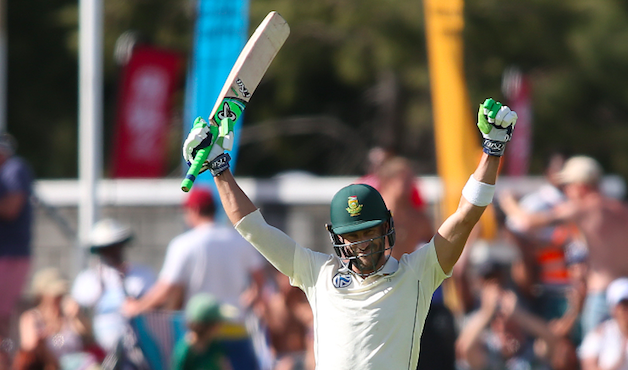 The Proteas resume their first innings tomorrow on 382-6, a very healthy lead of 205 runs. The first two days of this Test have seen a highly professional performance from the entire Proteas side that has fully justified the courage of the selectors in going with a four-man pace attack, while keeping faith with six specialist batters and a keeper-batter in Quinton de Kock. While Philander holds the mantle of Test all-rounder, his selection was based on his bowling – his batting is a happy bonus for the Proteas. Having the relevant firepower with the ball to roll the opposition is always the first step for success in a Test match, backed up by at least three batters making runs. 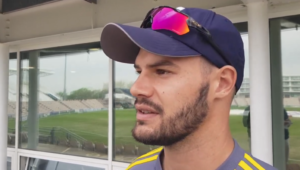 The Proteas batters’ somewhat more subdued approach to their innings has also played a major role for the team to build a solid lead in the face of good bowling from the Pakistan lineup.